Nomura intended hearts, as well as the strengths and connections of the heart, to be a common theme in the games. Characters within the Kingdom Hearts series are composed of three parts: body, soul, and heart. The body acts as a vessel for the heart and soul, with the soul giving life to the body. The heart holds their memories, and gives them emotion, light, and darkness. The Kingdom Hearts games are divided into various game levels, referred to as "worlds", which the player progresses through over the course of each game. Worlds vary in appearance, typically dependent on the Disney setting which they are based on. The worlds' graphics resemble the art style from the originating Disney film and the worlds are inhabited by characters from their respective films; for example, Hercules and Philoctetes appear in Olympus Coliseum from Hercules, while Aladdin, Princess Jasmine, and the Genie appear in Agrabah from Aladdin. The game worlds consist of interconnected field maps where battles and plot-related events occur. Players travel between worlds in different ways each game, such as the "Gummi Ship" in the original Kingdom Hearts, "Keyblade glider" in Kingdom Hearts Birth by Sleep, "Corridors of Darkness" in 358/2 Days, and "Sleeping Keyholes" in Dream Drop Distance. Worlds created specifically for the series mirror the overall appearance of the other worlds and predominantly feature characters from Final Fantasy games and original characters. Though Disney gave director Tetsuya Nomura freedom to choose which characters and worlds would be used in the games, he and his staff tried to stay within the established roles of characters and boundaries of the worlds. Nomura found managing and keeping consistent multiple worlds to be problematic. After determining the number of worlds in the universe, Nomura picked ones he felt would fit into the series' scenario. The list was then evaluated by his team and finally by Disney representatives. Nomura tried to maintain the same number of worlds in each game and made an effort to minimize any overlap in the overall look and feel of each world. He and his staff accomplished this by categorizing various Disney worlds by appearance and setting. For example, a world based on The Jungle Book was considered for the first game, but was omitted due to its similarity to Deep Jungle from Tarzan. They also tried to take into account worlds with Disney characters that would be interesting. For example, Nomura chose to include a Mulan world for its unique atmosphere. The Tron world's design was meant to emulate an old computer game in the style of the 1982 film. Nomura got the idea to include this world after seeing a Disney employee working on Tron 2.0. He hoped that the fact that it was so different from the other worlds would make it enjoyable to players. The symbol of the Heartless. The Heartless (ハートレス, Hātoresu) are creatures born from the darkness of people's hearts, lacking a body or soul, serving as the most common type of enemy the player encounters in the Kingdom Hearts series. Their name is derived from their lack of a heart, despite originating from people's hearts. When darkness consumes a character's heart, they become corrupted and turn into Heartless. The Heartless act as forces of darkness, seeking to consume more hearts, including those of worlds. Originally, the Heartless exist within an all-encompassing variety, the "Pureblood". Before the events of the first Kingdom Hearts, these Purebloods are typically only encountered in the realm of darkness, although people with a strong will may summon them to the realm of light. While studying the Pureblood Heartless, as a side effect of their research to control the mind through the heart, Xehanort and Ansem's other apprentices devise the means to create artificial "Emblem" Heartless via the corruption of living hearts, which are differentiated from Purebloods by an insignia on their bodies. Unlike Purebloods, Emblem Heartless release hearts once defeated. However, unless the Keyblade is used to defeat the Heartless, the stolen hearts go to the realm of darkness where they turn into Heartless again. This, combined with Maleficent's quest to gather the seven Princesses of Heart by using the forces of darkness, make the Heartless a common sight within the realm of light by the events of the first Kingdom Hearts. Ordinarily, the Heartless are mindless and function on instinct, but obey those with strong will. However, in worlds closer to darkness, the Heartless are stronger and become uncontrollable. They invade worlds through corridors of darkness, which are unpredictable pathways that interlink the many worlds. The symbol of the Nobodies. When Heartless are created, the body and soul of those with strong hearts that have lost their hearts to darkness become another type of creature called Nobody (ノーバディ, Nōbadi). As they lack hearts possessing light and darkness, they are "nothing", yet still exist within the Kingdom Hearts universe. Despite this, Nobodies have the potential to gain new hearts of their own through time, separate from their original selves. Nobodies typically assume malformed, inhuman shapes; however, the members of Organization XIII, a group of Nobodies central to the plot of the series, keep their human forms because they possessed strong hearts as humans and thus remember their original existence. Most members of the Organization control one type of Nobody suited to their fighting style. Like the Emblem Heartless, the Nobodies have an insignia—an upside-down, incomplete heart—which was designed to look like a splintered heart as a complement to the Heartless emblem. Upon being defeated, a Nobody fades into a state of non-existence until its Heartless counterpart is destroyed with the captive heart released, recreating the original being they were splintered from. Within the series, two Nobodies, Roxas and Naminé, are considered "special cases" regarding the circumstances of their births. Both are created when Sora uses Xehanort's Keyblade of heart to release his and Kairi's hearts, respectively, but because of many peculiar events, manage to exist alongside their original selves, rather than in lieu of them. Unlike Organization XIII's other members, who resemble their original selves with their memories and personalities intact, Roxas resembles Ventus rather than Sora due to holding the former's heart within himself, and has none of Sora's memories due to the short duration of Sora's Heartless state. Meanwhile, Naminé is born of Kairi's heart through Sora's body and, in addition to not having Kairi's memories, has the ability to alter the memories of Sora and those close to him. The symbol of the Unversed. The Unversed (アンヴァース, Anvāsu) are creatures that are introduced and predominantly appear in Kingdom Hearts Birth by Sleep. Described by Nomura as being "those who are not well-versed in their own existences", they are Vanitas' emotions given form, and feed on the negativity of others, which allows them to assume more powerful forms. Vanitas pits these creatures against his counterpart, Ventus, as a means of strengthening him as part of Master Xehanort's plan to obtain the χ-blade. Upon defeat, the Unversed's negativity reintegrates with Vanitas, allowing him to recreate them no matter how many times they are destroyed. The Unversed cease to be after Vanitas integrates back into Ventus and is subsequently destroyed within Ventus's subconscious, but are temporarily restored following his return during the events of Kingdom Hearts III. The most common symbol of the Bug Blox. Kingdom Hearts Coded sees the inclusion of software bugs, referred to in-game as Bug Blox (バグブロックス, Bagu Burokkusu) or simply "Bugs", as the game's main antagonistic force. To investigate a message hidden in Jiminy Cricket's journal left by Naminé, King Mickey has the book digitized to uncover the mystery; however, due to the "hurt" the message contains, most of the data ended up corrupted, resulting in the data worlds being infected with bugs. They primarily take the form of cubes that the game's main protagonist, a virtual replica of Sora called "Data-Sora", can destroy or use as platforms. There are several different varieties of Bug Blox, the most common, breakable variety being black-and-red in color. Other bugs take the appearance of boss-level Heartless that Sora had defeated in Kingdom Hearts. Villains and boss-level Heartless make use of the bugs to assist them in fighting Data-Sora. It is later learned that the recording of Sora's Heartless had gained sentience, and is responsible for the journal being blank even after the restoration of Sora's memories, due to how the book revolved around Sora; it seeks to devour the rest of the digital Heartless for power, and escape into the real world to sate its hunger for hearts. While its most basic form is the weak and common "Shadow" variety of Heartless, it grows increasingly powerful to the point where it takes other forms, such as an entirely black lookalike of Sora with yellow eyes, or a gargantuan variety of Heartless called "Darkside". The bugs cease to be after Data-Sora destroys the original bug and resets the entire datascape. The symbols of the Spirit (left) and Nightmare (right) Dream Eaters. Dream Eaters (ドリームイーター, Dorīmu Ītā) are primarily featured Kingdom Hearts 3D: Dream Drop Distance. Similar to the Heartless, they are beings of darkness that inhabit the Sleeping Worlds isolated from the realm of light, and are compelled to find the worlds' keyholes. Dream Eaters manifest in two kinds: hostile "Nightmares", which devour good dreams and create bad ones, serving as the enemies of the game; and benevolent "Spirits", which the player can create to serve as party members and combat the Nightmares. Several boss enemy Nightmares appear under the control of Young Xehanort and various Disney villains throughout the game. Riku also temporarily turns into a Dream Eater himself by subconsciously entering Sora's dreams upon sensing Xehanort's interference within the Mark of Mastery exam. The icon that represents the Keyblade. Keyblades (キーブレード, Kīburēdo) are key-shaped swords created to combat darkness and are the only thing that can free hearts from a Heartless form, thus allowing the restoration of complete beings. Keyblades also have the ability to lock and unlock all manners of doors and keyholes. Originally, these Keyblades were crafted in the image of the original "χ-blade" by those who wanted the light within Kingdom Hearts for themselves, and those who sought the opposite. Wielders that are acknowledged as "Keyblade Masters" can bequeath the power to wield a Keyblade to one they deem worthy by letting them touch the handle of the blade or connecting their heart to another. There are also Keyblades like the one Xehanort uses that are passed down from different owners through generations. A Keyblade changes in both appearance and strength with different keychains, which augment its wielder's fighting capabilities; some are obtained as a result of in-game events, while others can be obtained by completing mini-games. A driving element to the first game is the ability to seal the "heart" of a world by locking the keyhole to the door leading to it, preventing it from being destroyed by Heartless. In Kingdom Hearts II, the player uses the Keyblade to unlock pathways between worlds that were closed after the events of the first game. While Sora is the only one who uses the Keyblade in the first game, later games reveal more characters who wield Keyblades. In Birth by Sleep, Keyblades can be transformed into hovercrafts called Keyblade Gliders, which can be used to travel from world to world, making Keyblade wielders the only people with the means of transportation between worlds before Gummi Ships are used. The "gates" Sora would open later are known as the Lanes Between, which can be accessed by any Keyblade wielder. The χ-blade (χブレード, Kīburēdo, pronounced the same as "Keyblade") is an ancient weapon of unknown origin introduced in Birth by Sleep that is capable of directly unlocking Kingdom Hearts. It is a double-handed weapon that takes the shape of two "Kingdom Key" Keyblades that intersect in an "X" shape, with additional features that give it the shape of an actual sword. The weapon has the power to open the heart of all worlds, and it exists alongside Kingdom Hearts as its guardian. It led to "Keyblades" being crafted in its image by those seeking Kingdom Hearts' power, those who sought to extinguish the light, and those who sought to protect it. The end result was the Keyblade War, which ended in a world known as the Keyblade Graveyard; the aftermath led the χ-blade itself to shatter into seven pieces of light and thirteen pieces of darknesses. These seven lights, which are said to be the source of all light in the World, later became the hearts of the Princesses of Heart. In Birth by Sleep, Master Xehanort's over-eagerness to obtain the weapon has him seek to clash two hearts of equal strength—one of pure light and one of pure darkness—with each other. He finds such a means through his former apprentice Ventus and the youth's personified darkness Vanitas, whom Xehanort created and enlisted to ensure his plans succeed. Though Ventus and Vanitas fuse back into one being with the χ-blade in hand, the reunion is not complete as the unstable χ-blade eventually explodes due to Vanitas' destruction within Ventus. The events of Dream Drop Distance reveal that, as a contingency to his previous plan, Xehanort has arranged the formation of his thirteen "Seekers of Darkness", the new Organization XIII composing of his various incarnations and vessels, to fight the Keyblade users who would form seven "Guardians of Light", or target the Princesses of Heart, to recreate the χ-blade. The symbol that represents Kingdom Hearts. The titular Kingdom Hearts (キングダムハーツ, Kingudamu Hātsu) is the "heart of all worlds" and the source of hearts. It is an object of immense power and a central plot element that drives the conflict within the series as its light drove many to fight over it ages ago in what became the Keyblade War. In the end, Kingdom Hearts was consumed in the darkness caused from the conflict and the worlds became separate from each other. The return of Kingdom Hearts is sought by Master Xehanort during Birth by Sleep; while Kingdom Hearts does appear over the Keyblade Graveyard in the game, the flawed reunion of Ventus and Vanitas makes the unstable χ-blade explode, causing Kingdom Hearts to vanish. After splitting himself into a Heartless and a Nobody, Ansem (Xehanort's Heartless) seeks out the Door to Darkness to gain access to an artificial Kingdom Hearts created from the hearts of worlds, while Xemnas (Xehanort's Nobody) seeks to create his own artificial Kingdom Hearts from the hearts of people. These artificial constructs, however, are only small-scale versions of the "true" Kingdom Hearts, which can only be accessed with its counterpart, the χ-blade. Each Kingdom Hearts takes different shapes depending on from which hearts they are created. The first game's Kingdom Hearts, artificially created from the hearts of worlds, has the appearance of a sphere of light beyond a white door. The Kingdom Hearts made by the Organization XIII, on the other hand, takes the form of a yellow heart-shaped moon. The true Kingdom Hearts called upon by the χ-blade is depicted as a blue heart-shaped moon in Birth by Sleep, and yellow in Kingdom Hearts III. The World That Never Was is a new setting introduced in a secret trailer in Kingdom Hearts. 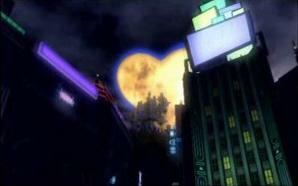 The heart-shaped moon is an attempt to create an imitation of "Kingdom Hearts", a central plot point throughout the series. The Kingdom Hearts universe is divided into planes of existence called "realms". Most of the series takes place in the "realm of light". Opposite the realm of light is the "realm of darkness", where Kingdom Hearts resides and where Heartless are born. The "in-between realm" is a plane where Nobodies come into existence. As well as these known realms, Ansem the Wise is banished to a "realm of nothingness", which he describes as a place "where all existence has been disintegrated". In the Kingdom Hearts universe, travel between worlds is normally not possible. Worlds are protected from extraterrestrial interference by an invisible shell. When the heart of a world is opened, the shell breaks apart, appearing as a meteor shower. Fragments from the wall are called "Gummi blocks" and are used to make spaceships called "Gummi Ships", which serve as the main mode of travel between the various worlds. Gummi Ships can be shaped into any structure, and the origin of the Gummi Ship material allows for travel to other worlds. Gummi blocks serve different functions, from navigation to offense and defense. Other methods to travel between worlds are the "corridors of darkness" and the "lanes between"—interdimensional pathways through which frequent travel eventually erodes unprotected users' hearts with darkness. These pathways are normally used by Heartless and Nobodies, but have been used by other characters in the series, including Riku and Mickey Mouse. Those who travel between worlds are advised to limit their interactions with the inhabitants of foreign worlds in order to maintain the world order. For this reason, the main characters change their appearance in certain worlds to avoid standing out. In the worlds based on The Little Mermaid and The Nightmare Before Christmas, Sora, Donald, and Goofy transform into undersea creatures and Halloween monsters, respectively. For The Lion King, they transform into savannah animals because Nomura felt that it would appear odd to have Sora and the others interact in their standard forms, since no humans appear in that film. The majority of worlds that appear in the games are based on Disney films. Most of these worlds, such as Wonderland, the Land of Dragons, and Castle of Dreams, follow abridged versions of the stories found in their respective films. Agrabah covers the first two Aladdin films in Kingdom Hearts and Kingdom Hearts II, while Atlantica and Halloween Town only mirror their films in the second game, having an unrelated plot in the first game. On the other hand, worlds like Monstro and Neverland focus heavily on the main Kingdom Hearts plot, the latter being reduced to Captain Hook's ship, where Riku reveals to Sora that Kairi has lost her heart; these worlds would not be able to be explored in full until the later releases of Kingdom Hearts 3D: Dream Drop Distance, Kingdom Hearts 358/2 Days and Kingdom Hearts Birth By Sleep, respectively. In the case of Beauty and the Beast, the Beast appears in Kingdom Hearts to aid Sora when he temporarily loses the Keyblade. After Beast's Castle is restored at the end of that game, the Beast becomes a pawn in the plot of Organization XIII during Kingdom Hearts II. During the development of Kingdom Hearts II, Nomura had more creative freedom due to advances in technology. Port Royal/The Caribbean, Space Paranoids, and Pride Lands, in particular, benefited from these advances. In Port Royal and Space Paranoids, the character models were generated from live-action pictures using a new program. Nomura had wanted to include a world based on The Lion King in the first game, but could not since its engine could not process quadrupedal character models properly, a feature which was resolved for Kingdom Hearts II. Birth by Sleep introduced several new Disney-based worlds to the series: Castle of Dreams, Enchanted Dominion, Dwarf Woodlands and Deep Space. Dream Drop Distance included more new Disney worlds, such as La Cité des Cloches, The Grid, Prankster's Paradise, Country of the Musketeers, and Symphony of Sorcery. Kingdom Hearts III introduces more worlds such as Kingdom of Corona, San Fransokyo, Toy Box, Monstroplis, and Arendelle. When questioned on the possibility of including worlds based on Disney-purchased properties such as Pixar, Marvel Entertainment and Lucasfilm, co-director Tai Yasue said, "We have to come up with a world that has a lot of originality. We want variety... so we don't want too many of one sort of world, that would look the same. For each world there has to be some meaning for it, in the plot... Also, gameplay-wise, is that world something that would make gameplay fun?" The game will not feature any worlds based on Final Fantasy. In addition to the Gummi Ship minigame, minigames feature prominently in certain worlds. While Atlantica is a normal world in Kingdom Hearts, albeit with a special "underwater" control scheme, it becomes an interactive rhythm game in Kingdom Hearts II which is completely unrelated to the overall story and serves as mere filler. Finally, Space Paranoids features a Light Cycle mini-game that strongly deviates from the original film. Nomura included this minigame because he knew people associated the Light Cycles with Tron. Disney Town: The Homeworld of Mickey, Donald, Goofy, and Pete. Parts of it include Disney Castle and two sub-worlds that depict the world's past. The first is called the Timeless River which is the "past" of Disney Castle, shortly before it was built. The world is portrayed in black and white; Nomura had intended it to be this way from the beginning of development. The world has many throwback effects including intentionally poor sound quality to imitate old cartoons. In this grayscale world, Sora's character model is simplified to the style of early cartoons, while Goofy and Donald Duck revert to their original designs from when they first appeared in Disney cartoons. The second sub-world is a sleeping world known as the Country of the Musketeers. Mysterious Tower: The residence of Yen Sid, which includes the sub-world Symphony of Sorcery that depicts the tower as it appeared in the past when Mickey became Yen Sid's apprentice. Olympus Coliseum': The homeworld of Hercules which serves as a place for optional fighting tournaments. Due to Hades' popularity, the Underworld was added in Kingdom Hearts II, where Hades has opened his own tournament. The worlds created specifically for the series predominantly feature original and Final Fantasy characters and figure more centrally to the overarching plot of the Kingdom Hearts series. The first world of each game serves as a tutorial to introduce new gameplay elements and frame the story. Both they and the Disney Worlds are stated to be fragments of the original world, identified in Kingdom Hearts III as Scala Ad Caelum which was the seat of power for the ancient Keyblade masters and serves as the final dungeon in the game. Destiny Islands: The home world of Sora, Riku, and Xehanort. Traverse Town: A world cobbled together from the remains of worlds destroyed by the Heartless, serving as hub world in Kingdom Hearts and as a sleeping world in Dream Drop Distence. Radiant Garden: The home world of Ansem the Wise, his apprentices, various Final Fantasy characters, and birthplace of Kairi. Due to the machinations of Xehanort, Ansem's study of the darkness in people's enable Terra-Xehanort to bring Radiant Garden into ruin. Throughout Kingdom Hearts and most of Kingdom Hearts II, Radiant Garden is known as Hollow Bastion, and is used by Maleficent as her base during the first game before Squall and his group rebuild the world as depicted in Kingdom Hearts II. The End of the World: A land created from the worlds that lost their hearts to the Heartless, serving as the final world in Kingdom Hearts. The Realm of Darkness: The home of the Pureblood Heartless, where Riku and Mickey appear at the end of Kingdom Hearts to help Sora seal the door linking it to the End of the World. Sora and Riku briefly visit in the realm in the end of Kingdom Hearts II, while Aqua spends years trapped in it following the events of Birth by Sleep. The Land of Departure: The homeworld of Eraqus and his apprentices, the world itself acting on the will of Eraqus before he passed his title to his appearance Aqua. Following the end of Birth by Sleep, Aqua uses her power to transform main castle of the Land of Departure into Castle Oblivion, which serves as the main setting of Chain of Memories, with its multiple floors holding memory-based reconstructions of other worlds created by via special cards. The world is later restored to its original state by Aqua in Kingdom Hearts III. Twilight Town: The homeworld of Hayner, Pence, and Olette where Ansem the Wise takes refuge as DiZ, serving as both a tutorial world and the penultimate world in Kingdom Hearts II. The World That Never Was: A world in the in-between realm that Organization XIII uses as their base of operations while working on their artificial Kingdom Hearts, serving as the final world in Kingdom Hearts II and Dream Drop Distance. This conception of Kingdom Hearts was designed to appear as the heart-shaped moon from the cover of the first Kingdom Hearts game. When the scenario writer, Kazushige Nojima, created the scenario, he described it as a moon floating in the World That Never Was. Upon reading this, Nomura thought of using the visuals from the first game to create a connection. The Keyblade Graveyard: A world depicted as the site of the final battle of the Keyblade War, and where the climax in Birth by Sleep takes place. Scala ad Caelum: A vast city that was the seat of power for the ancient Keyblade masters and where Eraqus and Xehanort trained in their youth, serving as the final world in Kingdom Hearts III. Daybreak Town: The homeworld of the Foretellers and their Unions, serving as the hub world in Kingdom Hearts χ. The series' setting has garnered mostly positive reception from critics. Following Kingdom Hearts's initial announcement, publications expressed skepticism towards the first game's viability. Andrew Reiner of Game Informer stated that despite the extreme differences between Final Fantasy and Disney properties, they blend well together along with the new content created for the series. A second Game Informer reviewer, Matt Miller, described the concept as a "hard sell", describing the combination of the two properties as "ridiculous". Though in contrast, he stated the franchise's formula is successful. The graphics of the games have received generous praise, with particular focus on their similarity to the source material. IGN stated that the "worlds look very much like their filmed counterparts". Japanese gaming site, Gpara.com also praised the look of the worlds. GameSpot referred to the worlds as "wonderfully rich familiar environments", and GamePro described the worlds as "spot-on with the original movies." Following the release of the first game, the Disney settings were well received by critics. Allgame's Scott Marriott stated the Disney settings are the most attractive feature of the game and considered some of the world choices a surprise. He praised the level designs, commenting that a good amount of familiar elements from the Disney films were integrated into them. Marriott further stated that though the stages were small, interacting with beloved characters and exploring familiar settings were enjoyable aspects. Maura Sutton of Computer and Video Games attributed the Disney elements as a major factor in creating the game's "astounding worlds". She summarized her review by calling Kingdom Hearts a "delightful mixture of two enchanted worlds". Video game critics of Kingdom Hearts: Chain of Memories expressed disappointment at the limited number of new worlds to explore in the game. 1UP.com's Bryan Intihar lauded Kingdom Hearts II's environment, calling it appealing and stating it was an improvement over the first title's. He described the level designs as "impeccable", citing the presentation of Timeless River stage's atmosphere. Intihar further commented that the expansions and changes to previous worlds made them "feel fresh". In contrast, Reiner described the Disney elements in Kingdom Hearts II as "tacked on". ^ a b c "Kingdom Hearts II Tetsuya Nomura interview". Video Game Blogger. Archived from the original on 2012-01-31. Retrieved 2007-07-21. ^ Square Enix (2006-03-28). Kingdom Hearts II. PlayStation 2. Square Enix U.S.A., Buena Vista Games. Secret Ansem Report #4: Three elements combine to create a life: a heart, a soul, and a body. ^ a b Birlew, Dan (2003). Kingdom Hearts Official Strategy Guide. BradyGames. ISBN 0-7440-0198-6. ^ Square Co. (2002). Kingdom Hearts Instruction Booklet. Square Co., Limited. ^ X-Play staff (2003-10-27). "Tetsuya Nomura on the 'Kingdom Hearts' Sequels". X-Play. Archived from the original on 2006-08-15. Retrieved 2009-08-07. ^ Gantayat, Anoop (2004-09-23). "TGS 2004: Tetsuya Nomura Q&A". IGN. Archived from the original on 2012-07-08. Retrieved 2009-08-07. ^ a b "Playstation.com Europe — E3 Interview". Kingdom Hearts Ultimania. Archived from the original on 2007-04-18. Retrieved 2007-07-23. ^ "Nomura Interview Dengeki 1". Kingdom Hearts Ultimania. Archived from the original on 2015-07-13. Retrieved 2007-07-18. ^ "KHU Interview w/Tetsuya Nomura". Kingdom Hearts Insider. Archived from the original on 2011-07-13. Retrieved 2007-08-10. ^ a b "Dengeki — Kingdom Hearts 2 Progress Report". Kingdom Hearts Ultimania. Archived from the original on 2007-06-08. Retrieved 2007-07-27. ^ a b c d e f "Nomura Dengeki Interview #3". Kingdom Hearts Ultimania. Archived from the original on 2007-06-11. Retrieved 2007-07-18. ^ Square. Kingdom Hearts. PlayStation 2. Square Electronic Arts. ^ Square Enix (2006-03-28). Kingdom Hearts II. PlayStation 2. Square Enix U.S.A., Buena Vista Games. Secret Ansem Report #5: Not only did they generate "pureblood" Heartless from living hearts, but they then used those Heartless to synthesize artificial versions of the creatures as well. These synthetic Heartless bore insignias and were called "Emblem Heartless." ^ Square Enix (2006-03-28). Kingdom Hearts II. PlayStation 2. Square Enix U.S.A., Buena Vista Games. Saïx: The Heartless ally with whoever is the strongest. ^ a b Square Enix (2006-03-28). Kingdom Hearts II. PlayStation 2. Square Enix U.S.A., Buena Vista Games. Yen Sid: The Heartless and the Nobodies will be using their own paths: Corridors of darkness, to travel from world to world. They may be attempting to link these dark pathways to the gates between the worlds. ^ a b Square Enix (2006-03-28). Kingdom Hearts II. PlayStation 2. Square Enix U.S.A., Buena Vista Games. Secret Ansem Report #7: When a Heartless is born, the body and soul left behind are reborn into this world as a different being. ^ Square Enix (2006-03-28). Kingdom Hearts II. PlayStation 2. Square Enix U.S.A., Buena Vista Games. Yen Sid: An empty vessel whose heart has been stolen away... A spirit that goes on even as its body fades from existence---for you see, Nobodies do not truly exist at all. ^ Square Enix (2012-07-31). Kingdom Hearts 3D: Dream Drop Distance. Nintendo 3DS. Square Enix U.S.A., Buena Vista Games. Xemnas: A heart is never lost for good. There may have been variances in our dispositions, but a number of us unquestionably showed signs of a burgeoning replacement. Once born, the heart can also be nurtured. Our experiments creating the heartless were attempts to control the mind, and convince it to renounce its sense of self. But understand, one can banish the heart from the body, but the body will try to replace it the first chance it gets, for as many times as it takes. And so I knew, even after we were divided into Heartless and Nobodies, it was just a temporary separation. ^ Square Enix (2006-03-28). Kingdom Hearts II. PlayStation 2. Square Enix U.S.A., Buena Vista Games. Secret Ansem Report #7: A great number of Nobodies have lost human form, as have the Heartless. Yet the Nobody born of someone with a strong heart retains its shape, with but the faintest visible changes. ^ "2nd Famitsu Nomura Interview". Kingdom Hearts Ultimania. Archived from the original on 2007-08-04. Retrieved 2007-09-20. ^ Square Enix (2011-01-11). Kingdom Hearts Re:coded. Nintendo DS. Square Enix. Yen Sid: Xehanort's heart, once seized by his Heartless half, is now free. And his body, which had become his Nobody, has been vanquished. Both halves will now be returned to the whole. ^ キングダム ハーツ バース バイ スリープ アルティマニア [Kingdom Hearts Birth by Sleep Ultimania] (in Japanese). Square Enix. 2010. p. 616. ISBN 978-4-7575-2788-1. ^ キングダム ハーツ 358/2 Days アルティマニア [Kingdom Hearts 358/2 Days Ultimania] (in Japanese). Square Enix. 2009. ISBN 978-4-7575-2578-8. ^ Yui (2008-08-02). "KH Birth by Sleep：DKΣ3713初の試遊台出展レポート、新たな敵は「アンバース」" (in Japanese). Archived from the original on 2008-11-20. Retrieved 2008-08-03. ^ "Interview with Tetsuya Nomura and Hajime Tabata". Famitsu. October 2007. p. 33. Archived from the original (translation) on June 13, 2008. Retrieved 2008-08-20. ^ "Information regarding KH3D's new enemy at TGS". Kingdom Hearts Insider. Archived from the original on 2011-11-05. ^ "Even more details about Kingdom Hearts 3D from the Tokyo Game Show". Nintendo 3DS Blog. 2011-09-16. Archived from the original on 2013-08-24. ^ Square Enix (2006-03-28). Kingdom Hearts II. PlayStation 2. Square Enix U.S.A., Buena Vista Games. Saïx: Pitiful Heartless, mindlessly collecting hearts. And yet they know not the true power of what they hold. The rage of the Keyblade releases those hearts. ^ Square Enix (2009-09-29). Kingdom Hearts: 358/2 Days. Nintendo DS. Square Enix. Marluxia:: The rest of us can defeat Heartless, but we have no way of collecting the hearts they release. Eventually, the hearts will turn right back into Heartless. ^ Square Enix (2006-03-28). Kingdom Hearts II. PlayStation 2. Square Enix U.S.A., Buena Vista Games. Hades: Let me see if I got this right... That brat's Keyblade works on any lock? / Pete: That's right. ^ Square Enix (2006-03-28). Kingdom Hearts II. PlayStation 2. Square Enix U.S.A., Buena Vista Games. Yen Sid: Because of your previous endeavors, the worlds have returned to their original states. That means the pathways between them have disappeared. / Donald: How do we get around? / Yen Sid: Do not fear. If what the King suspected proves true, the worlds have prepared new pathways along which you may travel. These pathways may be utilized by unlocking special gates. How these gates are opened, I'm afraid I do not know... However, the Keyblade will serve as your guide. When a beam of light radiates from the Keyblade, return to the Gummi Ship. ^ Famitsu Staff (2009-12-10). "A new fate and bond spun by the keyblade". Weekly Famitsu (in Japanese). Enterbrain. pp. 48–55. ^ Square. Kingdom Hearts. PlayStation 2. Square Electronic Arts. Kairi's grandmother: Long ago, people lived in peace, bathed in the warmth of light. Everyone loved the light. Then people began to fight over it. They wanted to keep it for themselves. And darkness was born in their hearts. The darkness spread, swallowing the light and many people's hearts. It covered everything, and the world disappeared. But small fragments of light survived, in the hearts of children. With these fragments of light, children rebuilt the lost world. It's the world we live in now. But the true light sleeps, deep within the darkness. That's why the worlds are still scattered, divided from each other. ^ Square Enix (2006-03-28). Kingdom Hearts II. PlayStation 2. Square Enix U.S.A., Buena Vista Games. Secret Ansem Report #3: I, too, have had everything taken away from me, banished to a hollow realm of nothingness. '^ Secret Ansem Report #5: In this realm, where all existence has been disintegrated, I have just barely managed to preserve my sense of self by continuing to think and to write. Square Enix (2006-03-28). Kingdom Hearts II. PlayStation 2. Square Enix U.S.A., Buena Vista Games. ^ a b c d e "Another Report" interview translated". Kingdom Hearts Insider. 2007-04-17. Archived from the original on 2007-06-20. Retrieved 2007-08-22. ^ Square. Kingdom Hearts. PlayStation 2. Square Electronic Arts. Yuffie: Before all this, you didn’t know about the other worlds, right? / Aerith: Because every world was isolated. Impassable walls divided them. ^ Square. Kingdom Hearts. PlayStation 2. Square Electronic Arts. Ansem's Report 5: Suddenly, a strange door appeared. I'd never known of its existence. It had a large keyhole, but didn't seem to be locked. So I opened the door. What I saw on the other side mystified me. What was that powerful mass of energy. That night I observed a great meteor shower in the sky. ^ Square. Kingdom Hearts. PlayStation 2. Square Electronic Arts. Ansem's Report 9: Simply astonishing! Today I had a guest from another world. He is a king, and his vessel is built of the material that composed the meteors. He called the pieces "Gummi blocks." It seemed that my opening the door has opened a path to interworld travel. ^ Hollinger, Elizabeth (2006). Kingdom Hearts II Official Strategy Guide. BradyGames. ISBN 0-7440-0526-4. ^ Square (2002-11-15). Kingdom Hearts. PlayStation 2. Square Electronic Arts. Goofy: Oh, right... I gotcha. While we're in the other worlds, we can't let on where we're from. We've gotta protect the world border. / Donald: Order. ^ Square (2002-11-15). Kingdom Hearts. PlayStation 2. Square Electronic Arts. Triton: As the key bearer, you must already know... One must not meddle in the affairs of other worlds. ^ Square. Kingdom Hearts. PlayStation 2. Square Electronic Arts. Donald: Okay, guys. Prepare for landing. / Sora: Land where? In the sea? We'll drown! / Donald: Not with my magic, we won't. Just leave it to me. ^ Square Co., Limited. Kingdom Hearts. PlayStation 2. Square Co., Limited. Goofy: This sure is a spooky place. I'll bet the people here are scary-lookin' too. / Donald: Don't worry. We look spooky, too. If they scare us, we'll scare them right back! ^ Kingdom Hearts (August 14, 2015). "The Heartless Dandelions make quite an entrance in Rapunzel's Kingdom of Corona in the #kingdomhearts III trailer!". Twitter. Retrieved August 17, 2015. ^ Carle, Chris (August 16, 2015). "D23 2015: KINGDOM HEARTS 3 ADDS BIG HERO 6 WORLD". IGN. Retrieved August 16, 2015. ^ "Square Enix Press Center - KINGDOM HEARTS III GOES TO INFINITY AND BEYOND". press.na.square-enix.com. Retrieved 2017-08-13. ^ MacDonald, Keza (December 2, 2014). "Marvel and Star Wars are "Not Off-Limits" for Kingdom Hearts 3". Kotaku. Retrieved December 2, 2014. ^ Corriea, Alexa Ray (June 14, 2016). "Kingdom Hearts 3 Won't Feature Final Fantasy Worlds". Game Spot. Archived from the original on 2016-11-28. Retrieved June 15, 2016. ^ Square Enix (2006-03-28). Kingdom Hearts II. PlayStation 2. Square Enix U.S.A., Buena Vista Games. Goofy: Let's see...if that door's connected to the past... / Donald: No, no, no! It comes here. / Sora: Huh? / Goofy: Then that means we're in the past! ^ Kingdom Hearts Series Ultimania α ~Introduction of Kingdom Hearts II~ (in Japanese). Square Enix. 2005. ISBN 4-7575-1597-9. ^ Square Enix (2006-03-28). Kingdom Hearts II. PlayStation 2. Square Enix U.S.A., Buena Vista Games. Tron: You can see the town back when it was first built. / Leon: That's right... I remember now. / Cid: Just like the old days... / Merlin: Hmm... I'd be fascinated to ascertain as to when the town got such a dreadful name as Hollow Bastion! / Aerith: You know, this town had another name once. / Sora: Hm? / Aerith: Radiant Garden. ^ Square Co., Limited. Kingdom Hearts. PlayStation 2. Square Co., Limited. Goofy: Gawrsh, is that all that's left of the worlds taken by the Heartless? ^ Kingdom Hearts II Piggyback Guide. Piggyback Interactive Limited. 2006. ISBN 978-1-903511-89-3. ^ Fennec Fox (2002-09-30). "Kingdom Hearts Review". GamePro. Bob Huseby. Archived from the original on 2008-12-27. Retrieved 2009-08-18. ^ Gerstmann, Jeff (2001-10-12). "TGS 2001 FallKingdom Hearts hands-on". GameSpot. Archived from the original on 2011-08-04. Retrieved 2009-08-18. ^ a b Harris, Craig (2004-12-13). "Kingdom Hearts: Chain of Memories". IGN. Archived from the original on 2012-02-12. Retrieved 2009-09-01. ^ a b Reiner, Andrew; Matt Miller. "Kingdom Hearts 2 Review". Game Informer. GameStop Corporation. Archived from the original on 2008-05-03. Retrieved 2009-08-18. ^ Jeff Haynes (2006-03-28). "Kingdom Hearts II". IGN. Archived from the original on 2006-06-15. Retrieved 2006-12-15. ^ "Review：大好きなディズニーキャラと、いつも一緒にいられる喜び。『KHII』レビュー" (in Japanese). Gpara.com. 2006-01-24. Archived from the original on 2014-02-25. Retrieved 2007-07-16. ^ Carrie Gouskos (2006-03-28). "Kingdom Hearts 2". GameSpot. Archived from the original on 2009-02-10. Retrieved 2007-07-24. ^ Fennec Fox (2002-09-30). "Review: Kingdom Hearts for PS2 on GamePro.com". GamePro. Archived from the original on 2008-12-27. Retrieved 2007-07-05. ^ Marriott, Scott Alan. "Kingdom Hearts — Review". Allgame. Archived from the original on 2016-11-28. Retrieved 2009-09-03. ^ Sutton, Maura (2002-11-30). "PS2 Review: Kingdom Hearts". Computer and Video Games. Archived from the original on 2007-05-09. Retrieved 2009-09-03. ^ Reiner, Andrew. "Kingdom Hearts: Chain of Memories". Game Informer. Archived from the original on 2008-05-03. Retrieved 2009-09-01. ^ Intihar, Bryan (2006-04-14). "Kingdom Hearts 2 Review". 1UP.com. Archived from the original on 2012-10-18. Retrieved 2009-09-03.